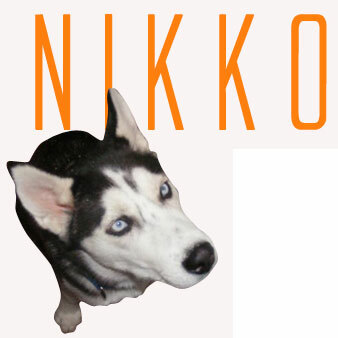 Nikko came into foster care on February 20, 2009...and never made it out! After a rough start to his young life, this then 5 month old ball of fur and energy immediately won the hearts of his foster family. And extended family, as he quickly became bestest buddies with his new Grandpop. Looking back, we now realize that we knew all along he wasn't going anywhere. That's probably why he never made it onto the site, as available for adoption! He fit right into our family, and his new brother and sister, Apollo & Siren, happily welcomed him in. Well...sorta. 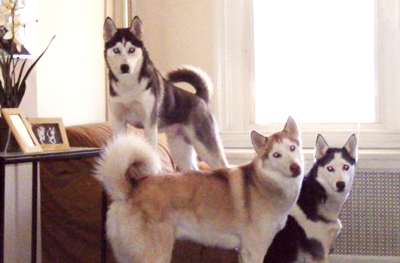 Nikko honestly believes that Apollo & Siren have one sole purpose in life - to play with him! He tries his hardest to ensure that naptime is not a frequent occassion in our house, as napping is at the very bottom of his priority list. As it's pretty much top priority for the other two, it causes a conflict of interest sometimes. But they've become quite a close knit pack. When they go to doggie day care, their teacher informs us that Apollo & Siren keeps a close eye on their little brother, and Nikko is constantly seeking them out among the other dogs. He came to us very well mannered, so our work was easy. Basic commands were cake for him and as his motto is 'Will Work for Food', he quickly learned the fun stuff like paw and kisses. He's affectionately become known as our 'watch dog'. He settles in at the front window, when the other two are napping of course, and stands guard. He barks his little head off at anything and everything that goes by. We're talking leaves, bugs, you name it. He's especially vocal when other dogs dare to walk by his house. Not knowing his own size, he thinks he's pretty tough! Speaking of size, at almost a year old now, he weighs in at a whopping 37 pounds! Being that one of his favorite activities is catapulting himself into your arms or on top of you for some lovin', we're happy he's stayed on the smaller side! He's a loveable little guy with a HUGE heart. Sometimes he'll stop whatever it is that he is doing, run over and up into your lap for a quick kiss, then happily go about his business. All in all, we feel very lucky that he came into our home and we think he's pretty happy that we never let him leave!